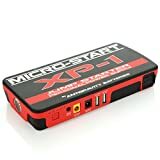 The Micro-Start SPORT is one of the smallest lithium-ion Jump-Starter/Personal Power Supply (PPS) units available. It's also the most compact Micro-Start Kit we offer. The SPORT is small enough to fit in your pocket yet so powerful it easily starts Cars, Trucks, Motorcycles, ATVs, UTVs, Snowmobiles, Watercraft & more. The SPORT has 150 Amps starting current with 300A Peak. JUMP-START vehicles with gas engine size up to 5L V8. (1995 and later model non-modified V8 Truck motors up to 350 cubic inches in size. Not intended for large V-twin motorcycles.) Conveniently, the SPORT can also CHARGE & POWER all your 5V USB devices. 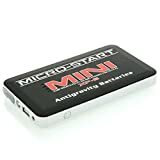 Charge your Smartphone, Tablet, PDA, GoPro or other Camera, PSP & other Handheld Games, MP3 Music Player, Bluetooth devices, more. Great capacity for back-up power: 7500 mAh. It can charge a cell phone ~4 times or a tablet ~2 times. MORE FEATURES: High-power LED Flashlight built-in + Lighted battery capacity indicator + Automatic power-off when not in use + Built-in over-charge and over-discharge protections for long battery life. SPORT comes as a complete kit with everything you need, including Accessories and an ultra-compact, durable Nylon Carry Case to neatly organize parts. KIT CONTENTS: 1 Micro-Start SPORT PPS; 1 set of SMART Mini Jumper Clamps (with thermal protections + multiple safety features: prevent reverse polarity connection, over-charge, over-discharge, short-circuit, back-charge); 1 universal 4-into-1 USB Cable (Tips: Mini USB, Micro USB, Apple 8-pin, Apple 30-pin). 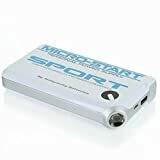 The SPORT is recharged by any Micro-USB connection, such as found on your computer, in your car, a hotel or an airport. Simply charge it once and take safe, reliable back-up power anywhere your active lifestyle takes you. Whether commuting, camping or traveling, remain confident you can start your vehicle or make an important call. If a smaller Micro-Start kit design that easily charges off existing USB ports is more beneficial to your use, the SPORT is the way to go! Charge & Power any USB 5V device: Tablets, Smartphones, Cameras and More! Extremely Compact: fits in pocket! 9.75 oz, 5" x 2.8" x 0.875"
Super sleek Design and build-quality with Smart Clamps.